Ford is suspending production of its F-150 trucks after a fire at a supplier's facility caused it to run out of parts for the nation's best-selling vehicle. Ford will temporarily stop making the F-150 at its plant in Dearborn, Michigan, on Wednesday night. The company had already suspended truck production at a plant just outside Kansas City, Missouri. Those are the only plants that make the truck. The F-150 has been the top selling US vehicle by any manufacturer for more than 40 years. It's a key profit generator for Ford (F). "Our goal is to get production up and running as soon as possible," said spokesperson Mark Truby. The auto maker is also pausing production of the Ford F-Series Super Duty, a larger version of the pickup truck, at its Kentucky Truck Plant in Louisville, but plans to continue production of the truck at another plant in Ohio. "This is a fluid situation, but we are working closely with our supplier partners to do everything we can to limit the impact on our production," said Joe Hinrichs, Ford's president of global operations in a statement. "We're confident that any impacts will be short term." The shutdowns could last for several weeks, according to a person familiar with the situation, although plans are in flux as Ford seeks an alternative supply of the missing parts. Even one missing part from a supply chain is enough to halt production of a vehicle. Ford has about an 84-day supply of the F-Series truck in dealers' inventories, according to the company. That's enough that there won't be any shortages in the near term. But if the shutdown lasts a month, buyers may discover the version of the truck they want — the type of engine, or the type of cab configuration or trim — won't be available. Those shortages are typical when vehicle inventory falls below 50 days. The precarious situation "demonstrates the riskier side of Ford's strategy to put all its eggs in the trucks and SUVs basket," said Ivan Drury, a senior analyst with the auto website Edmunds. "When you're more dependent on only a few models to drive sales, the company's bottom line is much more sensitive to these kinds of unplanned setbacks." Ford said in a statement that the shortage could affect near-term results but it still expects to hit the profit targets it gave to investors for the full year. The fire was at the Meridian Magnesium Products of America plant in Eaton Rapids, Michigan, on May 2. The plant supplies other automakers as well, but so far only one — Fiat Chrysler (FCAU) — has reported an impact on production. Ford has sold 287,000 F Series trucks in the United States in the first four months of this year, up 4% compared to a year ago. That includes some larger trucks than the F-150, although the F-150 makes up the overwhelming majority of those sales. It also is more than four times the sales of its second best selling vehicle, the Escape SUV. 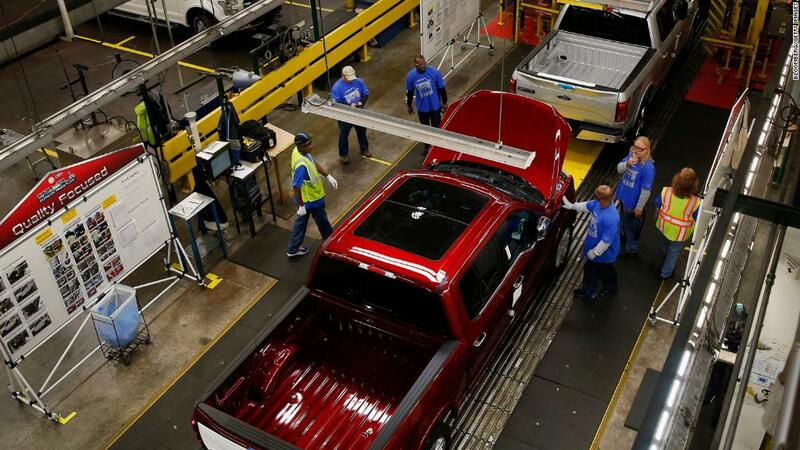 7,600 workers build F-150 trucks at the two plants. They will get most of but not all of their pay during the temporary layoff.